Since 1999, Solar Chippewa Valley has been serving the Chippewa Falls, WI area with site evaluation, solar panel installation, backup batteries and solar system repairs. 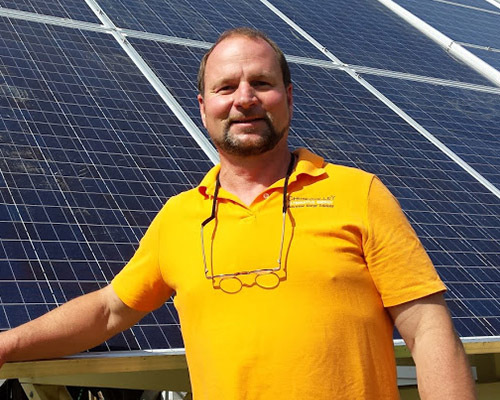 Owner Scott Robinson, has extensive training through the Midwest Renewable Energy Association and has 10+ years of experience designing and installing solar systems. We take pride in utilizing state-of-the-art tools and products to construct and install your custom-made solar system. At Solar Chippewa Valley, we specialize in designing and installing solar panels for clients in the Chippewa Falls, WI, area. We provide 100% turnkey installation and product support, while working closely with each customer to guarantee a positive experience before, during and after installation. Solar installation takes place at your designated area in Chippewa Falls, WI. Installations have a 5-year workmanship guarantee and include a 25-year warranty! We are fully insured and work closely with local permitting agencies to ensure a quality installation that meets all codes, regulations and your energy saving needs. We handle all permitting, applications, utility interconnection agreements, and any utility or rebate program application to make the process easier on our customers. You call; we design, install and handle it all. We’re family-owned and -operated, closely tying us to the local Chippewa Falls community. We have 30+ years of solar panel experience that sets us apart from our competition. We’re your energy experts! Interested in adding solar panels to your home? Let us know and we’ll handle the rest, including helping you budget and make an investment in the right equipment. Our solar installation process is safe and accurate. Installations have a 5-year workmanship guarantee and include a 25-year warranty. Something not working right? No problem. We’ll repair your solar system to its original condition. These solar storage systems provide cutting edge monitoring of production and consumption in the palm of your hand. When you come to Scott, he can provide you with a wide range of products from many different manufacturers to fit your unique need. Call our office at 715-720-5825 or send us an email at [email protected] We’re here to help you reduce your energy costs and lessen your environmental impact by designing a system that meets your individual energy goals.